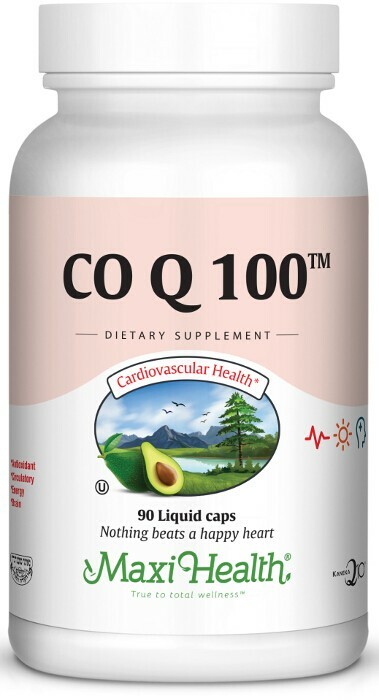 If you prefer the liquid cap form of Co Q 10 to take advantage of the greater absorbability, you really should consider Co Q 100 Liquid Caps™ from Maxi Health. Co Q 10 is a fat-soluble vitamin-like substance found naturally in all forms of animal life. It is bio synthesized in the membranes of cells in humans and is vital in the production of energy. It is found in most cells, with especially high concentration in the heart (the organ that requires high levels of energy for normal operation). Current lifestyles may promote the production of damaging free radicals. Co Q10 functions as an antioxidant, which neutralizes free radicals. Get Maxi Co Q 100 Liquid Caps™ today! Other Ingredients: Rice bran oil, vegetable cellulose, vegetable wax, d-alpha tocopheryl acetate, sodium copper chlorophyllin. This product contains no animal products, wheat, gluten, soy, yeast, salt, sugar, milk, corn, artificial flavors, colorings, or preservatives.